Nomad Adventures, represented in Australia by Swagman Tours, operate fantastic value-for-money overland safaris throughout Southern and Eastern Africa, on a camping and accommodated basis. Group sizes are restricted, ensuring you have a fantastic trip without feeling lost in a crowd. If you dream of having an authentic African adventure, a Nomad small group tour is one of the best ways to achieve it. Everything is organised and planned for you, leaving you free to relax and immerse yourself in your African experience. Nomad's fleet of custom-made trucks are specially-designed for rugged African conditions. New small group tour vehicles feature luxury-leather reclining swivel-chairs for comfort, personalised air-conditioning and USB charging ports, an on-board toilet and more. Nomad's overland safaris are very popular across a broad age range, offering an affordable way to cross the most spectacular parts of Africa, making new friends as you go! Camping or Accommodated – What’s the difference? Accommodated tours fill the gap between a camping experience and an expensive lodge tour, while camping tours give you a truly African experience. On all tours excluding the Cape Town to Victoria Falls (and sections) both camping and accommodated guests travel together. All meals are prepared at the truck, you have the same guides and the travel times are all the same so that literally is the only decision that you have to make – a bed or a tent. Nomad's specialised tailor-made specialists can cater to your requirements and assist you to design the dream holiday of a lifetime, whatever your budget. Nomad's experience and expertise throughout Africa means they can create unique group tours for any number of travellers, both private individuals and groups with a range of transport options. 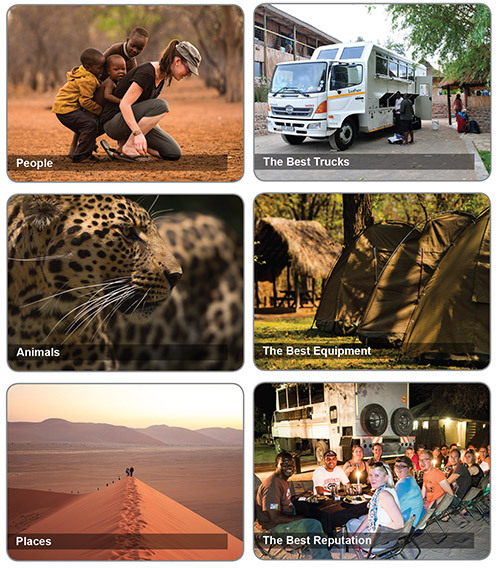 People who ordered Nomad Adventures Africa also ordered the free travel brochures below. Click on the images to find out more about these brochures.